Orono, ME — On Saturday, the Bangor Symphony Orchestra was named the 2018 recipient of The Wilma Award by the Collins Center for the Arts. Named after longtime Bangor arts patron Wilma Bradford–a loyal BSO attendee and supporter for almost 70 years–The Wilma Award celebrates an organization or individual who has shown extraordinary commitment to serving the community through the Collins Center for the Arts. 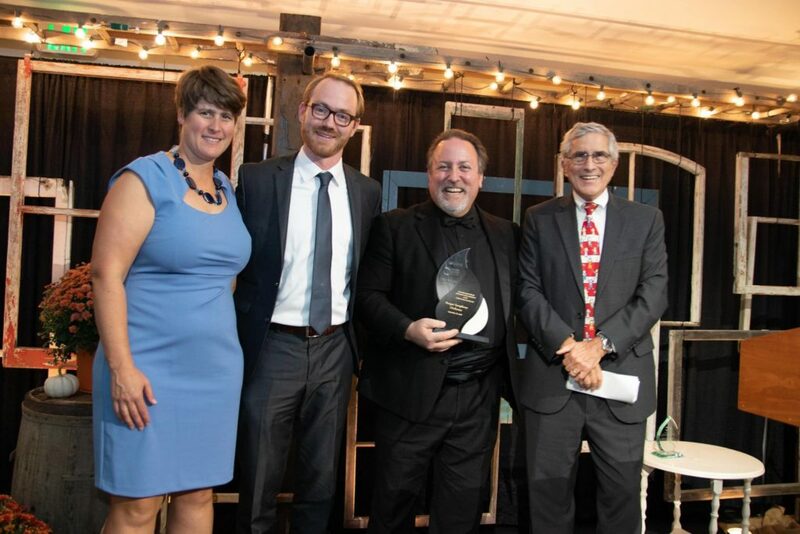 Presented by Berney Kubetz of Eaton Peabody, the Award was accepted on behalf of the BSO by Music Director and Conductor Lucas Richman at the Collins Center for the Arts Gala on the opening night of their 33rd Season at the University of Maine. The BSO extends its thanks to the Collins Center for the Arts Advisory Board and Gala Committee for this honor, as well as the musicians, staff, board members, and volunteers who exemplify our commitment to inspiring the community through music. From L to R: Director of Development Sarah McCarthy, Executive Director Brian Hinrichs, Music Director Lucas Richman, and Board President Berney Kubetz accepting The Wilma Award.